Like endorphins, a third movie makes everyone happy. At long last, Reese Witherspoon will be reprising her role as Elle Woods for a third Legally Blonde movie, 17 years after the first film (and 15 years after its forgettable sequel). In June 2018, Deadline reported that MGM and Witherspoon were close to finalizing a deal for Legally Blonde 3. Here’s what we know so far. The film comes out in 2020. Specifically, Feb. 14, 2020, according to an MGM announcement on Twitter. Reese will play Elle Woods once again. And Elle's famous sequined bikini she wore to apply to Harvard might be back. On June 7, the actress shared a video of herself floating across a pool a la Elle Woods on Twitter, along with the words, "It's true." No other cast members have been confirmed. Writers from the first film will be back. 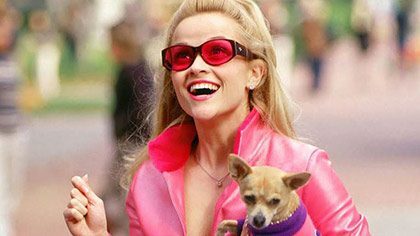 Reese will also be one of the producers of Legally Blonde 3. Under her production company Hello Sunshine, Reese will join Platt and Siegel in the producers' chairs. FYI: Hello Sunshine is also responsible for gifting the world with Big Little Lies, which is currently filming its second season with Witherspoon. The company also most recently signed a deal with Hulu to adapt Celeste Ng's book Little Fires Everywhere into a series. Expect the third film to have the same "spirit" as the first. The plot is still under wraps, but don't surprised if you see Elle Woods in office. In March 2017, Reese joked about a potential storyline for her character during an appearance on The Late Late Show with James Corden. When James suggested a seat in the White House, Witherspoon said, "She could be a Supreme Court Justice or she could be like a really great, powerful attorney or she could be in prison. She could be anything."